To make a reservation, a 50% deposit of your reservation total is required at the time of booking. Deposits can be made with cash or credit card. Remaining deposit is due (2) weeks prior to the reservation. A driver's license is typically used for identification purposes. Rates are quoted for a daily, single use rental. Items rented for a weekend event would typically be delivered on Thursday or Friday and picked up on Monday. If you require a longer rental period, please contact us for rate information. All charges are for time out use whether used or not. Pricing is subject to change without notice. Final changes to item counts need to be placed (3) days prior to delivery or customer pick up. After that, orders are packed or loaded, so therefore cannot be reduced. Equipment added to your order one day prior or on the same day of your event may require a last minute delivery fee, or you are welcome to pick up the items from our location if the items are available. If the truck has already left when you call and change your count, you are responsible for paying for the items in full. Complete cancellations made prior to (2) weeks of the event rental will receive a refund of 50% of the initial deposit. Cancellations made within (2) weeks of the event will not receive a refund. No refunds on specialty order items. Tent reservations cancelled prior to (6) months of the event will receive a full refund of the deposit. 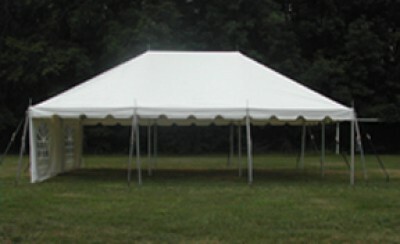 Tent reservations cancelled less than (6) months prior to the even will forfeit the deposit and 50% of the total amount. A Damage Waiver fee of 8% of the rental cost is charged on all items leaving the building. This fee relieves the customer of any accidental damage to the rented items. The Damage Waiver does not cover the cost of replacing missing items or negligent use of the equipment. Excluded from this waiver are any loss or damage due to theft, disappearance, mildewed linens, burns and tears in any linen. Missing items are not covered. The Damage Waiver fee is non-refundable. The customer is responsible to the equipment while in their possession. Be sure the equipment is secured when not in use and protected from the weather. Most items require a deposit to cover any additional charges that need to be assessed for late, soiled or missing items. This deposit is returned to the customer after we have received the rental items back in clean and good working order. Our store and offices are located at 1375 N. Shawano Street, New London, WI. We are conveniently located off Highway 54. We are open year round from 7:00 am - 5:00 pm Monday - Friday and from 7:00 am - 4:00 pm on Saturday. We are closed Sundays. Items you are picking up must fit safely inside your vehicle. You are responsible for loading and unloading your vehicle. C & B Rent-All is not responsible for any damage to personal property that may occur during loading and unloading. Deliver is available for an extra charge between 8:00 am and 5:00 pm. Fees are determined by zip code and vehicles required. Other deliver times can be arranged with our office staff. Rates quoted are for ground floor deliveries. Our staff is instructed to stack all items at a place immediately accessible to our truck. Set up and takedown is available for a fee if arranged in advance with our office staff. Rental items need to be returned to their point of delivery. China, glass and flatware should be washed and dried and placed back in their supplied totes. Linens should be dried and ready for pick up. All items should be in a single location and ready for pick up. Items not meeting these conditions are subject to additional fees. If you have any questions regarding our Rental Policies, please contact us. Last updated 02 April 2013. Information subject to change without notice.